May 30, 2011 - Garmim, AeroMech and Corporate Aircraft announced that the Federal Aviation Administration (FAA) has approved a Supplemental Type Certificate (STC) package for Reduced Vertical Separation Minimum (RVSM) certification of the G600 installed in select aircraft. The STC package is available for G600 installations on the Cessna 441 Conquest II with an ARC 1000 autopilot, which enables Conquest II operators to fly RVSM flight profiles from Flight Level 290 to the aircraft?s maximum operating altitude. This allows Conquest II pilots to gain fuel savings, lower their carbon footprint, increase range and give them the flexibility to fly above bad weather. 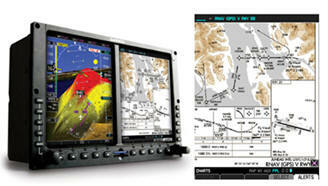 ?As Garmin?s premier aftermarket flight display, the G600 is the perfect complement to the Conquest II,? said Gary Kelley, Garmin?s vice president of marketing. ?And now, with the RVSM certification, it has even more to offer operators including the enhanced flexibility to fly more efficiently and more safely at higher altitudes.? ?The Garmin G600 RVSM solution in the Cessna 441 provides Conquest operators with the ability to fly safer by flying above the weather and for less with up to a 26% less fuel burn. The G600 system provides altitude preselect using the G600 altitude bug, further reducing pilot workload and simplifying the scan,? said Pete Tsaris, Corporate Aircraft?s general manager. ?Working with Garmin and AeroMech Inc. was a great experience for Corporate Aircraft and together this group was able to develop the best possible RVSM solution for the Cessna 441.? The G600 is a certified avionics system designed specifically for FAR Part 23 Class I, II or III aircraft and is ideal for those wanting to transform their panel from gauges to glass. It shows critical flight data on two six and a half inch diagonal flat-panel displays. These screens are mounted side by side in a single bezel that fits neatly into the ?six pack? slot of the instrument panel. The G600?s PFD shows attitude, airspeed, climb rate, altitude and course/heading information over a virtual terrain image with SVT?, and the MFD displays detailed moving-map graphics of the aircraft?s current position in relation to ground features, chart data, navaids, flight plan routings and more. Installations of RVSM-compliant G600 avionics may be completed at a Garmin authorized dealer. G600?s that are certified for RVSM will include the GDC 74B air data computer, altitude pre-select, and other required hardware. Pricing for the equipment and STC package will begin at approximately $80,000. AeroMech Incorporated, an FAA STC ODA, specializes in aircraft engineering and certification services, including RVSM for aircraft OEMs, modification shops, and owner/operators. Since its inception in 1995, AeroMech has completed over 140 STCs, 450 flight-tests, and successfully certified more than 6,500 commercial, military and business aircraft through 19 regulatory agencies worldwide.